Greetings again from the darkness. While I will never tire of seeing really cool dinosaurs on the big screen, I’ll probably never avoid frustration from a poorly written and poorly acted film. On the bright side, I got to see this at the Grand Opening of the beautiful new Alamo Drafthouse in Denton, Texas. 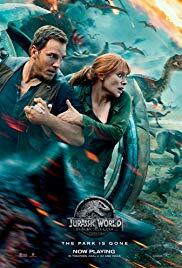 A 66 foot curved screen with the best available sound system made the dinosaurs that much more impressive, while simultaneously exposing the acting for the disappointment it is … especially the almost impossible to watch Bryce Dallas Howard. J.A. Bayona directs this follow up to the 2015 JURASSIC WORLD, but he’s saddled with a subpar script from the writers and director of that previous entry, Derek Connolly and Colin Trevorrow. The creatures of the late, great Michael Crichton deserve better. In addition to the aforementioned Ms. Howard (as Claire Dearing), Chris Pratt also returns as the smirking Owen Grady, and this time he flashes some fighting skills that would make Jean-Claude Van Damme proud. Not sure how his experience training baby dinosaurs and building a cabin in the mountains prepared him to single handedly take on an army of armed mercenaries, but such things are possible in a cartoon … which is exactly what this plays like: a live action cartoon with high dollar special effects. We have a spoof of a villain in Eli Mills, played by an over-the-top Rafe Spall, a quivering techie played by Justice Smith (PAPER TOWNS), a tough Paleo vet in Daniela Pineda (MR ROOSEVELT), a dying billionaire former partner of John Hammond played by James Cromwell, a greedy capitalist who should be twirling a mustache in Toby Jones, a big-gun toting badass by Ted Levine, and a good-hearted housekeeper played by Geraldine Chaplin. Mr. Cromwell and Ms. Chaplin add a touch of class in their all too brief scenes. BD Wong is back doing things with dino DNA, and sadly, Jeff Goldblum probably filmed his two courtroom scenes in a couple of hours. One nice addition is young Isabella Sermon, in her screen debut. She is part of the only decent twist in the story. Despite the disappointments, it remains awe-inspiring to see the dinosaurs on screen. If only those moments weren’t ruined by such superfluous bits such as a close up of Ms. Howard’s footwear to prove that she’s not wearing high heels in the jungle this time. Director Bayona has three very fine movies under his belt: THE ORPHANAGE (2007), THE IMPOSSIBLE (2012), and A MONSTER CALLS (2016). He’s likely to make more good films during his career, and this will surely be a box office smash because people love seeing the dinosaurs, and are willing to overlook the people. As a frequent movie goer, I’m just unable to cut slack to a mega-budget film that expects us to overlook shoddy writing and laughable acting. We don’t expect to recapture the (25 years ago) magic of Steven Spielberg and composer John Williams in the stunning JURASSIC PARK, but we do expect a better effort than this. Greetings again from the darkness. You may be excused if you believe there have been enough boxing movies recently. Just last year, we saw Creed and Southpaw – both critically acclaimed and featured significant screen time inside the ropes. Writer/director Ben Younger returns with his first movie since 2005 (Prime) and teams up with screenwriter Angelo Pizzo to present the “based on a true story” of Rhode Island’s own Vinny Pazienza. Mr. Pizzo is known for his work on inspirational sports films like Hoosiers, Rudy, The Game of Their Lives, and My All-American; so the fascinating and true story of Paz is right in his wheelhouse. See, The Pazmanian Devil (his nickname) was a terrific fighter, and is even more famous for his medically-defying comeback after a horrific car accident. The doctors doubted he would ever walk again, and offered Vinny no hope at all of ever fighting again. 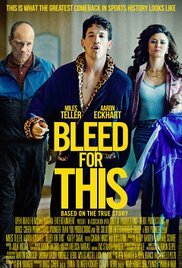 Miles Teller (Whiplash, The Spectacular Now) plays Vinny Pazienza and obviously trained very hard to get in tip top shape. His boxing skills are well suited to the training sequences but must be creatively edited for the scenes in the ring. This is especially obvious when clips of the real Paz are inserted. Beyond that, Teller softens the overblown machismo of Pazienza and the boxing world. He captures the single-minded commitment of Pazienza, while making him a bit more likeable than the real man came off in interviews. Aaron Eckhart is excellent as Pazienza’s (and Mike Tyson’s former) trainer, Kevin Rooney. It’s puzzling how Eckhart’s name ever came up for the role of a balding, pudgy, alcoholic who believes he’s been put out to pasture … but Eckhart and Teller together produce some wonderful scenes. Other support work comes from Ciaran Hinds and an underutilized Katey Sagal as Vinny’s dad and mom, and Ted Levine and Jordan Gelber as boxing promoters Lou and Dan Duva. The comeback was as improbable as it was inspirational, and the decision to go with the Halo (metal brace that screws into the skull) over the neck fusion surgery could easily be categorized as foolish rather than courageous. But much of the story revolves around the internal make-up and competitive drive that made Vinny the man and the boxer that we see. The film has more in common with The Fighter than either of the movies mentioned in the first paragraph, but it’s even more character study than boxing movie. This proud, driven, egotistical local from Providence held world titles at three different weight classes, refusing to be limited by the opinions of others. Rather than end with a classically Hollywood shot of victorious Paz celebrating in the ring, the film ends with an odd interview centered on his debate against the phrase “it’s not that easy”. It’s a stance that makes us question whether he ever learned the lessons of gamble vs risk. Mostly though, we marvel and agree that he’s a guy who deserves to be on a box of Wheaties.